Q.1.What was the role of trade guilds ? Explain. (iii) They also had the right to restrict the entry of new producers into the trade. Q.2.The proto-industrialisation helped in building a close relationship between the town and the countryside”. Explain. Ans. (i) Merchants were based in towns but the work was done mostly in the countryside by the peasant households. spun was taken in subsequent stages of production to weavers, fullers, and then to dyers. (iii) The finishing was done in London before the export merchant sold the cloth in the international market. Q.3. During the first World War years, industrial production in India boomed. Give reasons. Ans. (i) Manchester imports into India declined as British mills were busy with war production. (ii) Indian industries were also called upon to supply war needs ;Jute bags, doth for the army uniform, tents and leather boots (iii) Even after the war. Manchester failed to recapture its old position. Q.5. Who created the cotton mill ? How did it help in improving the production ? Ans. Richard Arkwright had created the Cotton mill. (i) The costly machines could be purchased, set up and maintained in the mills. (ii) Within the mills, all the processes were brought together under one roof and managed. This allowed a more careful supervision over the production process, a watch over quality and the regulation of labour, all of which had been difficult to do when the production was in the countryside. Due to industrialisation in Britain, their export market collapsed. As British traders started exporting machine- made clothes to India, so their local market shrank. (ii) Shortage of raw material : As raw cotton was being exported to England, there was a shortage of raw materials. When the American Civil War broke out. and the cotton supplies from the United States were cut off. Britain turned to India. As raw cotton exports Iron India increased, the price of raw cotton shot up Weavers in India were starved of supplies and forced to buy raw cotton at higher prices. (iii) Clashes with Gomasthas : Gomasthas were appointed by the government to supervise weavers to collect supplies and examine the quality of cloth. The Gomasthas acted arrogantly and punished weavers for delays in supply. So. the weavers dashed with them. (iv) System of advances: The Britishers started the system of advances to regularise the supply of cotton and cloth. The weavers eagerly took the advances, in a hope to cam more but they faded to do so They even started losing small plots of land which they had earlier cultivated. Q.7. Write a short note on the development of factories in India. Explain the growth of factories in India. Ans. (i) Cotton and jute mills were the first to be established in India The first cotton mill was set up in 1854 at Bombay Mumbai (ii) By 1864. the number rose to four The textile null was followed by the jute mill which came into existence in 1855 in Bengal. (iii) Another jute mill was established in 1862 in Bengal itself. (v) By 1874. the first spinning and weaving mill of Madras (Chennai) began is production. Q.8. How were the Indian merchant industrialists discriminated by the Britishers ? Mention some of the problems of the Indian merchant industrialists. (ii) Restriction on export of manufactured goods : The Indian merchants and traders were barred from trading with Europe in manufactured goods, and had to export only raw materials and food grains-raw- cotton. opium and wheat, indigo recquired by the British. (iii) Introduction of modern ships: With the entry of modem ships Indian merchant were edged out of the shipping business. (iv) Exclusive chambers of the Europeans : The European merchant-industrialists had their exclusive chamber of commerce, and Indians were not allowed to become its members. 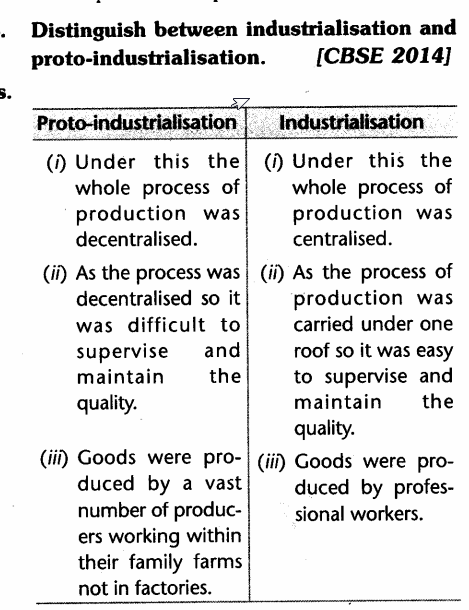 Q.9.Explain the major features of pre colonial trade and industries. (ii) Trading partners: Armenian and Persian merchants took the goods from Punjab to Afghanistan. eastern Persia and Central Asia. Bales of fine textiles were carried on camel back via the north-west frontier, through mountain passes and across deserts. (iii) Major ports: A vibrant sea trade operated through the main pre-colonial ports. Surat cn the Gujarat coast connected India to the Gulf and Red Sea Ports Masulipatam on the Coromandel coast and Hoogly in Bengal had trade links with Southeast Asian ports. Q.10.What was the impact of colonisation of India on the Indian traders and merchants ? Ans. (i) By the 1970s this network, controlled by Indian merchants, was breaking down. (ii)The European companies gradually gained power – first securing a variety of concessions from local courts, then the monopoly rights to trade. This resulted in a decline of the old ports of Surat and Hoogly through which local merchants had operated. Exports from those ports fell dramatically, the credit that had financed the earlier trade began drying up and the local banker slowly went bankrupt. European ships. While many of the old trading houses collapsed, those that wanted to survive had to now operate within a network shaped by European trading companies. Q.11. Name the provinces where most of the large-scale industries were located. How can you say that small-scale production continued to predominate even in the late 20th century ? (i) Only a small proportion of the total industrial labour force worked in registered factories. i.e. only 5 per cent. (ii) There was an expansion in the handicraft industries. (iii) In the 20th century, handloom cloth production expanded steadily, i.e. almost trebling between 1900 and 1940. Q.12. in the 20th century, the handloom cloth production expanded steadily, i.e.. almost trebling between 1900 and 1940.’ Give reasons. (ii) By the second decade of the Twentieth century, most of the weavers started using looms with a fly shuttle. This increased productivity per worker, speeded up production, and reduced the labour demand. By 1941. over 35 per cent of handlooms in India were fitted with fly shuttles: in regions like Travancore,Madras (Chennai) Mysore, Cochin and Bengal where the proportion was 70 to 80 per cent. (iii) There were several other small innovations that helped weavers to improve their productivity, and compete with the mill sector. Q.13. “By the 1860s Indian weavers failed to get sufficient supply of raw cotton of good quality”. Give reason. Ans. (i) American Civil War : 1860s was the era of American Civil War. When the American Civil War broke out and cotton supplies from The US were cut off, Britain turned to India. As raw cotton exports from India increased, the price of raw cotton shot up Weavers in India were starved of supplies and forced to buy raw cotton at exorbitant prices. (ii) Industrialisation in India : By the end of the 19th century factories in India began producing machine made cloth. This also reduced the supply of raw cotton ill the market. Ans. (i) Consolidation of the Fast India Company’s power after the 1760s did not initially lead to a decline in textile export from India. (ii) British cotton industries had not yet expanded. (iii) Fine Indian textiles were in great demand in Europe. Ans. European Managing Agencies which controlled a large sector of the Indian industries were : (i) Bird Heiglers & Co.
(iii) Jardme Skinner & Co.
(i) European Managing Agencies mobilised capital. (ii) They set up joint stock companies and managed them. (iii)In most instances. Indian financiers provided the capital while the European Agencies made all investment and business decisions. The European merchants- industrialists had then own chambers of commerce which Indian businessmen were not allowed to join. Ans. (i) The spare within which Indian merchants could function, became limited. (ii) They were barred from Trading with Europe in manufactured goods. (iii) They had to export mostly raw materials and foodgrains ,raw cotton, opium, wheat and indigo required by the British. (iv) They were gradually edged out of the shipping business. (v) Till the First World War,European Managing Agencies controlled a large sector of Indian industries. Ans. (i) Producers of coarse cloth: Amongst weavers some produced coarse cloth while others wove finer varieties. The coarser cloth was bought, by the poor and its demand fluctuated violently. In times of bad harvests and famines when the rural poor had little to eat. and their cash income disappeared, they could not possibly buy cloth. (ii) Producers of finer varieties: The producers of finer varieties were in a better position because the demand for the finer varieties bought by the well- to-do was more stable. The rich could buy these even when the poor starved. Famines did not affect the sale of Banarasi or Baluchari saris. Moreover, as you have seen, mills could not imitate specialised weavers. Saris with woven borders, or the famous lungis and handkerchiefs of Madras, could not be easy displaced by mill production. Ans. Getting lobs was always difficult, even when mills multiplied, and the demand tor workers increased. The numbers seeking work wore always more than the jobs available. Entry into the mills was also restricted. Industrialists usually employed a jobber to get new recruits. Very often, the jobber was an old and trusted worker. He got people from his village, ensured them jobs, helped them settle in the city, and provided them money in times of crisis. The jobber, therefore, became a person with some authority and power. He begun demanding money and gifts for his favour, and began. controlling the lives of the workers. Ans. . During the war British mills were busy in war production to meet the needs of the army, Manchester’s imports into India declined. (ii) After the war. Manchester could never recapture its old position in the Indian marker. Unable to modernise and compete With the United States. Germany and Japan,the economy of Britain crumbled after she war. Cotton production collapsed, and exports of cotton cloth from Britain fell dramatically. (iii) Within the colonies, local industrialists gradually consolidated the:: position, substituting foreign manufactures and capturing the home market. Q.20. Why did the upper class people prefer to use hand products in the Victorian period ? Explain with examples. (i) They symbolized refinement and class. (ii) They were better finished, in They were individually produced and carefully designed.